American Evangelical Christian leaders praised the opening of the U.S. embassy in Jerusalem on Monday and the American leader for keeping his promise to recognize Jerusalem as the capital of Israel. Christians United for Israel's founder and chairman Pastor John Hagee, who gave the benediction at the embassy ceremony, told JNS that he is "deeply proud" of his country and its president. "I was deeply honored to participate in this historic moment. Jerusalem is the eternal capital of Israel, and I am very proud of my country and my president for recognizing that fact," said Hagee. "This moment would not have been possible were it not for President Trump's courage and the unwavering commitment of CUFI's 4.1 million members." The embassy ceremony in Jerusalem was attended by some 800 guests from the United States and Israel. "Israel is a sovereign nation with the right like any other nation to determine its own capital," Trump said in a video greeting at the embassy ceremony. "Today we follow through on this recognition and open our embassy in the historic and sacred land of Jerusalem." Israeli Prime Minister Benjamin Netanyahu said: "Remember this moment, this is history. President Trump, by recognizing history, you have made history." Pastor Mario Bramnick, president of the Latino Coalition for Israel, told JNS that he was "amazed" by the embassy move. "We are in amazement with today's movement of the U.S. embassy to Jerusalem. We are so proud of President Trump's historic actions today." David Parsons, vice president of the International Christian Embassy Jerusalem, told JNS that "The ICEJ joins with the people and government of Israel in rejoicing over the historic events of this day, as the United States brings its Embassy up to Jerusalem." "We are praying and working towards the goal of many more nations taking their rightful place in this city in due recognition of its status as the capital of Israel. Jerusalem has to be shared as a 'house of prayer' for all peoples, but the proper sovereign and custodian of the city is the Jewish people. They were the first and only nation in history to truly honor and select Jerusalem as their capital and the focal point of their national identity, and it is most fitting that they be the ones to see this special city through to its glorious destiny." Similarly, Mat Staver, founder and chairman of Liberty Counsel and president of Christians in Defense of Israel, noted that the embassy opening was a "historic" day for America and Israel. "Today is a historic moment when on the 70th anniversary of the re-establishment of Israel, the U.S. embassy opens in Jerusalem," said Staver. "The timing could not be more appropriate to open the embassy at the 70th anniversary of the founding of the modern state of Israel. We celebrate with the Jewish people for this long-awaited event." 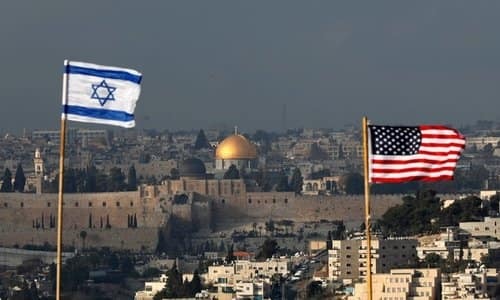 For many evangelical Christians, the issues of recognizing Jerusalem as Israel's capital and relocating the U.S. embassy to that city have been top priority for years. Evangelical Christian groups, who have been strong supporters of Trump, strongly lobbied the American leader to keep his campaign promise of moving the embassy during his first year in office. Rabbi Yechiel Eckstein, who heads the Jerusalem-based International Fellowship of Christians and Jews, credited the Christian community for playing a "critical" part in ensuring the recognition of Jerusalem as Israel's capital. "U.S. recognition of Jerusalem as Israel's eternal capital and the decision to move the U.S. embassy to the Holy City on the Jewish state's 70th anniversary could not have happened without critical U.S. Christian support," said Eckstein. He added that "Israel's future rests on continuing and strengthening the Christian bond with Israel." One such effort includes a new comprehensive building in Jerusalem about a mile from the embassy to accommodate Christian visitors to Israel.